Chlorine damage, Kids Hair, MN | Kids' Hair Inc.
Chlorine doesn’t just get on the hair, it gets into it, and is especially attracted to children’s fine hair. Chlorine build-up can make hair tangled, brittle, sticky, shiny (like a Barbie Doll’s Hair) and even make hair green! Shampoo with a clarifying or swimmers shampoo. 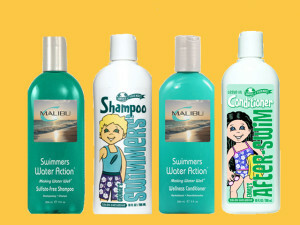 We carry Malibu Swimmers Wellness Shampoo and Circle of Friends George’s swimmer’s shampoo. Follow with a good conditioner, even a leave-in conditioner to add moisture back to the hair. 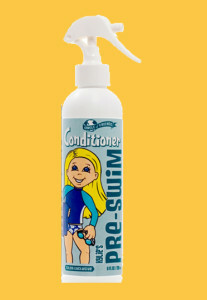 We carry Malibu Swimmers Wellness Conditioner and Circle of Friends Emma’s After-Swim conditioner. Kids’ Hair offers an in-salon Malibu Treatment that naturally removes chlorine, minerals and salts. Who needs a Malibu Treatment? For kids with longer hair that swim multiple times a week, a Malibu Treatment once a month can really help reverse and prevent damage. For the casual summer swimmer, getting a treatment every 2-3 months helps remove the chlorine that has built up on their hair and scalp. Safe and gentle for all ages/hair types, our Malibu treatment naturally removes chlorine, oxidizers, minerals and salts without harsh chemicals and leaves hair soft, healthy and strong. The treatment process takes around 30-45 minutes and appointments are recommended. 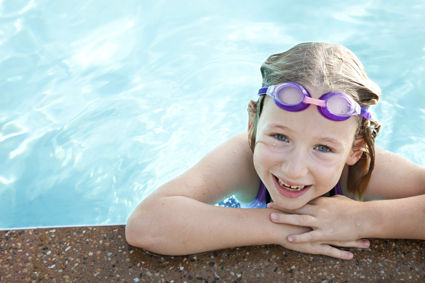 Visit any of our locations and ask a Kids’ Hair Stylist to learn more about ideas, tips and products you can use to help keep your little swimmer’s hair healthy and manageable!